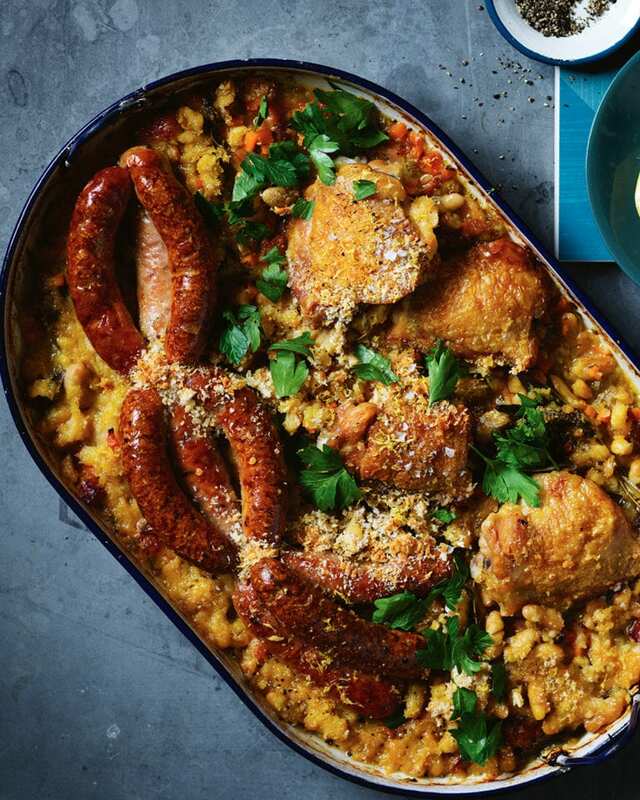 A French-inspired recipe, we’ve taken a classic cassoulet and added chicken thighs. It’s a hearty winter warmer best enjoyed on a cold blustery day. Heat the oven to 180°C/160°C fan/gas 4. Heat the oil in a deep flameproof roasting tin on the hob over a high heat, add the chicken and chipolatas and cook for 10 minutes, turning until golden on all sides. Set aside. Add the soffritto mix and lardons to the tin and cook for 10 minutes or until the vegetables have softened, stirring occasionally. Add the garlic and parsley stalks and cooking for 1 minute more. Pour over the wine, bring to a simmer and cook until reduced by about half. Stir in 200ml stock, the herbs and cannellini beans, then season well. Return the chicken, skin-side up, to the tin, then tuck in the sausages and roast for 30 minutes. Check halfway through, adding a little extra stock if it’s looking dry. Mix the cheese and breadcrumbs with a generous pinch of salt and freshly ground black pepper, then sprinkle over the top of the chicken and sausages. Return to the oven for a further 20-25 minutes until the top is golden and the chicken is cooked through. Serve scattered with chopped parsley leaves and lemon zest with the lemon wedges on the side for squeezing. a medium oven until piping hot throughout, then sprinkle with the parsley, lemon zest and serve with the lemon wedges. Mirepoix is the French version of soffritto, an Italian mix of diced onion, carrot and celery that’s used as a base for soups and stews. You can buy ready-prepared soffritto in some supermarkets (it can be used frozen) or chop up your own. This hearty dish needs a full-bodied, rounded white. Try a good-value white burgundy such as a mâcon-villages or saint-véran.